Both Admiral Allen and Kent Wells (audio only no transcript yet) held press conferences today. 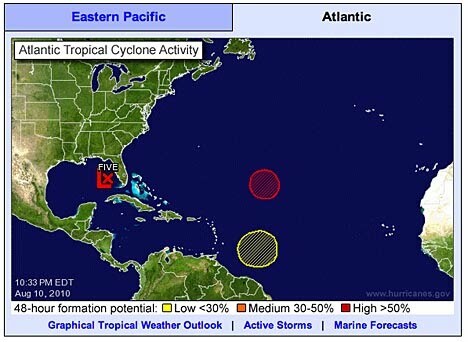 The primary focus in both cases was the weather, with the currently approaching storm producing waves that are causing a halt to operations. The storm is not seen as being very threatening, to the point that the riser will not be disconnected. However the drill pipe is being withdrawn, a storm packer inserted into the hole, and the riser filled with sea water. As a result, if there is a problem, the drilling rig can release from the well without creating further complications. But it allows a faster recovery if nothing untoward happens. The relief well had made it 50 ft beyond the casing and has been surveyed. In the next step it will go another 30 ft before a survey, and then (getting closer to the original well) another 15 ft and so forth. At any time it may intersect the well, and so it might be appropriate to explain (as both parties did) what is expected, and where the intersection can occur. When I had earlier written about the intersection and the injection of the cement into the bottom of the well it was before the well had been killed from the top. The situation at the moment is that the bottom 5,000 ft of the well inside the casing has been filled with cement. The vertical gap between the two outer cement linings which (for simplicity) I have shown as very short is actually likely to be a couple of hundred feet long perhaps. The inner cement plug within the production casing stretches several thousand feet above the intersection point. The bottom of the well is some 800 feet further down the production casing. At the present time the well is being held at 4,200 psi pressure at the BOP to check and see if there are any leaks. Just as an observation when you put that much pressure on that long a solid confined column it will dissipate out to side loading long before it gets down to this depth, so the test does not have that much value in these particular circumstances. As far as testing the integrity of the central concrete plug neither will the negative pressure test which they intend to follow the current positive pressure test with. In this case they will lower the pressure in the well to 2,300 to 3,000 psi, and see if the well makes fluid. 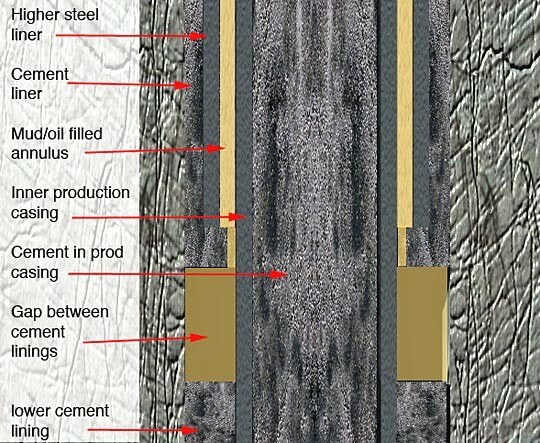 Again, because of the length of the concrete column in the production casing, that drop in pressure will not extend down to the intersection point (let alone the bottom of the well) and thus won’t provide that much information on the conditions at the reservoir. What it will do, however, is provide some information about what might be going on in the annulus and particularly what might be in the gap, and the condition of it before the relief well runs into it. If the integrity of the production casing remains, (except potentially at the bottom of the well) and all the mud and cement flowed down it, and into the formation, then there may be no way for the fluids in this annulus to have escaped the well. (I have colored them an off yellow since we don’t know if they are oil or mud). 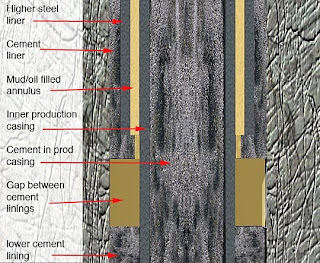 If they are the original drilling mud, and the lower cement lining around the production casing has retained enough integrity to seal this zone off from the bottom of the well and the reservoir, then this may even still be the mud used just prior to the cementing of the production casing. In that case the well is really already well sealed, although for insurance they will likely pump cement into the well to fill the gap and back up the annulus a few hundred feet with more cement. Doesn’t matter then what the condition of the bottom of the well is – there is no path for fluid to get up the well. If on the other hand they find some oil in the gap then this could indicate that the cement had lost some integrity, and allowed some oil passage (but then how did it then get into the solid steel pipe of the production casing?) But again, pumping cement into the well to fill the gap will provide a permanent seal without needing to go much distance down into the lower cement lining to assess its condition. Because the original well could well now be a sealed system then the actual fluid in this section will be determined by looking at what comes back up out of the relief well as it drills into the gap. There is a caveat to this, however. If there was a massive failure of the lower cement liner down to the reservoir, then when the relief well strikes the gap there will be a path for mud to flow down into the well, pushing the fluid before it down into the reservoir. The mud weight that they are using is a 13.8 ppg mud, and so this should displace down to the reservoir. By monitoring the flow and the pressure it will be possible then to determine the size of the flow channel, and other values. If that happens it might complicate the analysis of what actually is the condition of the bottom of the original well. But the treatment remains the same. Stabilize the well, then inject the cement to form a plug in the gap and back up the annulus, and the well is sealed. Because of the currently anticipated storm it is expected that there will be a delay of perhaps a few days more before the intersection occurs, but with the condition of the rock around the well in the unsupported (unlined) section somewhat unknown it is not going to be possible to accurately predict exactly when that intersection will occur.